Help! I am trying to replace my lock with a new lock that I bought at bunnings and I’m here with my screwdriver but look at this what kind of screwdriver do I need for this! What is this. I’m very confused. I tried poking it but it doesn’t come off. 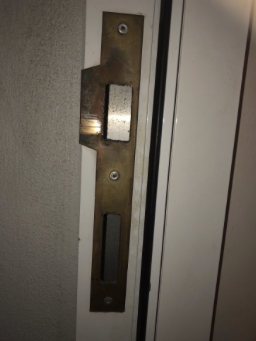 What can I use to remove the lock?? 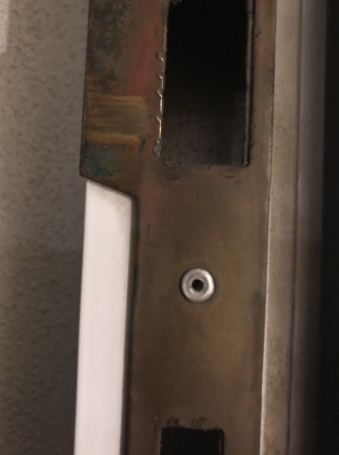 Either the holes to secure the strike plate became very worn and the technician decided to "rivet" it into place or it might be a security addition. Drill those out using a small bit and keep increasing in size until the rivet falls out. You might find that the threads still exist so be careful and you might not have to use rivets to reinstall the strike plate. Not the answer you're looking for? Browse other questions tagged doors tools screws lock or ask your own question.